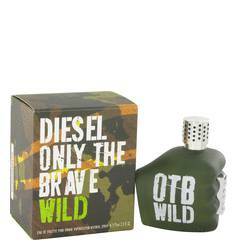 Only The Brave Wild Cologne by Diesel, Throw caution to the wind each and every time you wear only the brave wild, a men’s fragrance from diesel. Launched in 2014, this masculine blend expertly meshes lavender with lemongrass and grapefruit, while black pepper adds requisite spice to the mix. Wear this exuberant, carefree aroma as you charge through a productive workday or after hours as you enjoy the fruits of your labor. It pairs equally well with dapper business attire and the casual apparel you don for weekend adventures.